The last election in Israel did not bring forth a stable government in Jerusalem. ” “Zionist” Herzog does his best to bring down Netanyahu III before the new minsters have taken office. “No responsibility, no governance and no stability,” Herzog wrote on his Facebook page, describing the new government. “Once again the mask of leadership was removed from the prime minister’s face, showing his arrogance and complacence in the embarrassing farce of forming the weakest, most extortionist and most narrow government in Israeli history,” he went on to say. It is not easy to predict Israeli politics. No place in the western civilization, things can change so quickly. Even a Prime Minister can leave his political party, and form another. Some time back i wrote that Zionist Israel is falling apart. There will be no support for the Jewish settlers in Judea and Samaria. They will be branded as the last enemies of “peace”, also by claimed to be Jews. The wafer thin new government of Benjamin Netanyahu has come to power based on support from political parties that can hardly sit in the same room. Less talk to each other, and enter into agreements. Sitting on his neck, Benjamin Netanyahu has got an anti-Zionist opposition leader, who claim to be the head of the “Zionist Union”. The leader of the only true Zionists. Neither do Isaac Herzog want more Jews to settle on the mountains of Zion. Nor do he what to secure that East Jerusalem is not brought back under Islamic occupation. The true menaing of words are replaced with deceptions. The 61-59 majority in the Knesset will be short lived. Some of Netanyahu’s religious supporters will soon defect the Government, and pave the way for yet another election. 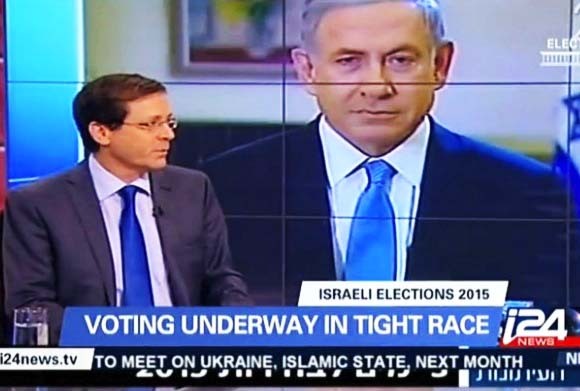 And there is no guaranty that the next Israeli election will change the realities on the ground. The Israeli people stand divided. There is no political, no economical not military solution to Israel’s problems. Till the day Yeshua the Messiah is back, the Israelis will suffer distress unequaled to what we have seen since the days of the creation. Therefor repent, and accept the Messiah. Only he can give both Jews and gentiles true peace.